Trump Campaign: Change Your Early Votes - Joe.My.God. “We hear you Pennsylvania! Nobody likes to be duped! You can change your early VOTE by calling 1-877-868-3772. Join the MOVEMENT. LETS #MAGA!” the tweet, which was later deleted, read. 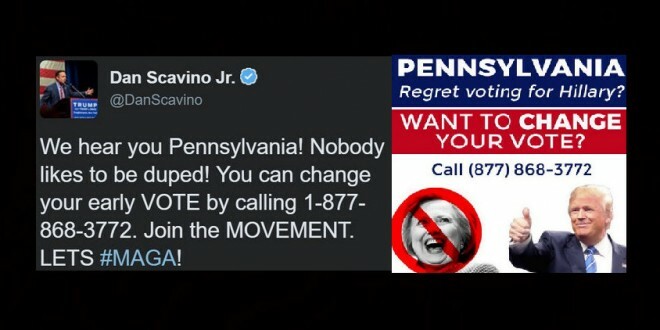 The number Scavino posted connects callers to the Pennsylvania Department of State’s Bureau of Commissions, Elections, and Legislation. Pennsylvania does not allow early in-person voting in the way states like Florida and North Carolina do. Pennsylvanians who want to vote early must request an absentee ballot through the mail and provide a reason as to why they cannot vote in person. Those who typically vote by an absentee ballot include college students, service members and their families.